For years women have been packing two pairs of shoes - the fashionable footwear for the office, and the shamefully uncool commuter shoes. 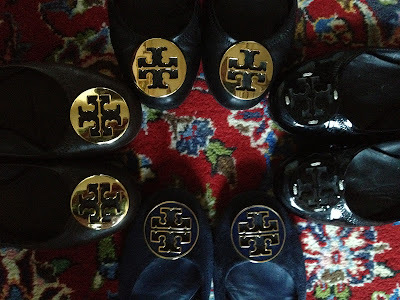 Well, then along came Tory Burch, introducing both style and comfort all in one. Good-bye old sneakers! I absolutely love Tory Burch's Reva Ballet Flats. I, myself, have acquired mostly practical colors of blacks and browns and neutrals, but she also makes so many fun colors and patterns, all inclusive of her signature logo - a classy "T" branding. Styles do change seasonally, so if you don't fall in love with any of the current shoes available, don't worry, yours will make its way to the website soon. But believe me that once you try on your first pair, you will be smitten. It's a little different at first, and I don't recommend socks or tights, the back binds better on the bare foot.